Your dog will bark with enthusiasm after an afternoon at Park Cities Pet Salon! We have only one goal in mind: making your companion look and feel its best. So bring your furry friend to our Dallas, Texas, pet salon for complete grooming services at affordable prices. 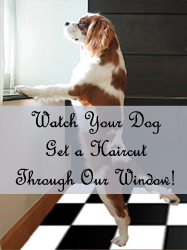 With our excellent dog grooming, bathing services, and various pet products, we create a look that you will love. Since coming under new ownership, our pet salon has expanded it's services to cater to a wider clientele. We've added cat grooming, boarding services, and included our Furminator service to help reduce shedding in your pet. Stop in today to find out how Park Cities Pet Salon has improved to provide complete grooming services for your pet. Our bathers, groomers, and other employees are caring and professional. about how we can make your pooch look like the best dog in the park.